Anyone who follows me on Twitter knows that if I am not tweeting about education and technology, then I am probably tweeting about two other things; weather and the Louisville Cardinals. This post focuses on a project by the National Severe Storms Laboratory that wants to help identify weather conditions on the ground. Because radar systems focus on conditions in the upper atmosphere, we often see radar with weather on top of us, but no precipitation falling. The goal of this project is to help with "nowcasting." The PING (Precipitation Identification Near the Ground) project uses an iPhone App or Android App to help report current conditions. If no access to an app is available, then weather reporting can also be done on the PING website. "PING is looking for young, old, and in-between volunteers to make observations—teachers, classes and families too! We have collected over 45,000 observations since 2006, already making PING successful because of your help." This tool would be a great addition to science classrooms to report weather conditions for an experiment in a science classroom and have students log when they create a report and see conditions for different areas of your town. In a recent snowstorm in my area, a range of 30 miles had a difference between 1-6 inches. As reports go in, they appear on the PING Data Display Page. You can see a sample image below. The PING website also provides a valuable lesson for learning about various types of precipitation that can occur during weather events. Remember that safety is a first priority and people should not put themselves in danger in order to report weather conditions, especially during severe weather. That should be left to trained and educated professionals. In education we constantly talk about making it relevant, meaningful, and hands-on. The PING Project allows for an opportunity to do such reporting while also teaching students about honesty and weather. In a little over three years this blog has reached 600 published posts; a feat I wasn't sure I would succeed at as my job description has changed 3 times during that same time period, and I don't say that in a negative way at all. 2012 has been a good year for me and my family and I really can't complain that much about it, although I know that is not the case for a lot of people around the world. In 2012, dramatic changes have started to take effect across the country in education and in technology. Common Core has replaced state standards in English and Math and a move towards Science is slowly beginning, at least here in Kentucky. I am worried about the future of the social studies curriculum as we move towards a Math, Reading, and Science focus in schools. It would be very beneficial for future social studies teachers to have a "Teaching Reading" class in Teacher Education programs as teaching reading is of greater emphasis in the social studies classrooms. 2012 will become known as the year of assessments, and in Kentucky our new accountability model recently got its inaugural year out of the way. I am not sure this movement towards multiple assessments will go anywhere anytime soon, but I hope that someone sooner or later gets into a position of authority to realize that all that is truly happening is massive profits for the testing corporations. There is value in assessments, just not the way it is being pushed across our country. The Sandy Hook shooting, unfortunately, will probably have a large impact on our schools as movements are made to increase security and place police in all schools. Someone should really take a look at how the increase in assessments and standards based education possibly correlates with an increase in violence towards schools. Not sure there is one, but it is a thought that has crossed my mind recently. The growth of iPads and Tablets in the classroom and the aspect of digital textbooks replacing paper versions will be growing substantially in the future. More and more teachers are expected to be implementing the use of technology by students; while at the same time teacher education programs lag behind in preparing teachers and schools fight with the benefits and dangers of BYOD/BYOT. Most of the dangers are due to a lack of education at a young age on Digital Citizenship...because it is not "tested." Social Media is changing how we receive news and even report it. I find myself searching Twitter or Facebook to get the latest information more than my television or other Internet sources. At the same time, I have to double check the information that comes across social media for accuracy. And as evident with the Sandy Hook tragedy, even news stations report inaccurate information in order to be first instead of correct. I think a lot of that has to do with social media. They know if they are first to report it, it will spread, and then it creates more visits to their websites and TV stations, thus increasing their revenue from advertisements. Collaboration between teachers and students, teachers and parents, schools and parents/students, and students with students will be a major shift in thought in the next few years, in my opinion. More and more technology is available to make these avenues of communication and collaboration possible. The question will be the success and implementation of its use among educators. The top posts of this blog through the years can be found in my Anniversary Post from November plus the 10 Cell Phone Apps for Teachers post that I did recently that was popular as well. I am not sure where this blog will go in the next year, but I hope that I can continue updates with numerous posts per week relating to education and technology. My goal is to have more posts in 2013 then I did in 2012, so we will see. What are your thoughts for the coming year and future of education? Feel free to link to your own post in a comment below. I don't know about you, but I find it hard to recall all that has happened in the past month, let alone an entire year. An end of a year is often my favorite time because it offers a time of reflection and remembrance. Thanks to the incredible amount of use that Google search gets, we can actually look back on a year just by looking at the trends and hottest searches done on Google. Through the Zeitgeist 2012 Review from Google users can watch a video of highlights (which I have embedded below), see the trends for searches, the top searches in various categories (which can also be downloaded), break down searches by country by drop down or on a map, and if so inclined discover what you searched for the most (if you enabled web history in your Google profile. When we all head back to school in 2013, this might be a great video to show at the beginning of class and allow students to reflect on people and events they recognize or that has been discussed in class. As mentioned above, you can download a copy of the list. This could be a helpful classroom resource to use in the classroom through the years showing changes and similarities in Google search trends. Themeefy allows users to add content and create a digital flip-book/magazine of the content of their choice. The website also allows users to search and view previously created magazines which can be browsed by category or searched for through key words. When users have completed a magazine, they can share it in several different ways and the site also allows users to provide information about themselves. To get started, users don't need to sign up; however if they want to save a magazine it will be necessary to sign up. Users provide each magazine a title and a brief description. Themeefy at this point does a Google search on the title of the magazine for users and allows users to read more or add the information from the search to the magazine. As you want to add more pages to the magazine, you conduct more Google searches, look for information on Twitter, Facebook, YouTube, Flickr, or create a page with your own content. Adding your own content allows for a URL, Title, and Description. You can also add notes and an image as well. Themeefy automatically adds an image and text from the website. Users can edit that information. It also automatically provides the source of the information as well. Students have a hard time remembering to do that, so it is a necessary aspect of the software. I am not sure about my complete thoughts on this application yet because it allows for a lot of "copying and pasting" if done for students use. I could envision teachers using this as a way of providing links to information about topics covered in the class. Themeefy definitely has some aspects that are worth examining for implementation in the classroom. Here is a video that explains adding your own content and lets you see the layout of the site. Quotebook is an App for iDevices that allows users to easily track, capture, copy and paste quotes into a central location (app). Each quote can be categorized and tagged with keywords. I could see teachers using this to track quotes that they want students to use in the classroom and I could see students using this app to track quotes and parts of a book they are doing for research. I could also see this being used by students who are avid readers as a way to save their favorite parts of a book. Quotebook is available in the App Store at a cost of $2.99. Quotebook is synced to iCloud and Instapaper. You can also link to Facebook, Twitter, and Tumblr accounts as well. The service allows users to also mark the author and source of the quote making it easier for students to document where they get the quote from and also so they can look up other quotes by the same author. For a quick glimpse at how it is used, see the video below. InkleWriter is a website that helps writers tell interactive stories while also providing opportunities for adaptive reading. The software aims to give readers a choice as they read to what happens next. As a writer, you develop those choices and the software makes it easy for you to continue the writing. I like this idea because it creates an engaging avenue for readers to the text they are reading. After writing a story, users can actually have it converted to an eBook for Kindle. Christmas is just around the corner and the kids in your classroom or at your house are probably interested in seeing when Santa will be where. Well, Google has their Santa Tracker read to assist you. There is currently a countdown that kids can see. From this page you can find Santa on Google+, download an Android App or install a Chrome Extension. And what is fun this year, is tracking Santa on Google Earth. My son is 5 turning 6 and enjoys my iPad as much as I do, so I am looking forward to sharing this tracking tool with him. Through the Google Tracker site there are graphics and games as well that kids can play related to Christmas and Santa Claus. A cool feature is a virtual "chat" with Santa to set up personal phone calls, messages on Google+, and an email. You provide some information, and Santa will contact your kid. For more information about the Santa Tracker, click here. If you don't want the Google Santa Tracker, the NORAD Santa Tracker is a good option as well. It has a countdown as well and here is a short video about it. Share My Lesson, from the American Federation of Teachers and TES Connect, is a website dedicated to providing teachers an avenue to share lessons they are doing in their classrooms and assist teachers in finding lessons to use in their classroom. Because of the creation of Common Core, we are seeing quite a few of these sites pop up. Teachers Pay Teachers is another option that has teacher resources for free and for purchase and you can find my profile HERE. It has links to my free eBooks and to a lesson planner. On Share My Lesson teachers can get information about Common Core Standards and a forum to discuss the implementation of the standards. A featured section currently has information on how to respond to a school crisis, something all of us teachers are thinking about. They are also running a contest where teachers can win a vacation for being the top resource uploader. With the holiday season, they also have resources and activities for teaching about the holiday season. If you need a place to ask questions or get more information, there is a Forum Area for those discussions as well. There are currently over 250,000 free teaching resources to be used in the classroom and they are divided by grade level and there is a section for special education as well. When you click on the grade level (which can also be broken down to individual grades), you can then look at the various content areas as well and they are broken down by individual subjects within a content area, which are then broken down by units most commonly found in those subject areas. In a trial use in searching for resources, I found Share My Lesson to be easy to navigate and purposeful in their direction in serving teachers. They have several partner websites that have share lessons as well, so not everything is teacher submitted; but that does not take away from the quality. By creating an account, users can save searches, add favorites, follow other users, and of course, add their own resources. EduClipper...think of it like Pintrest for Educators. From the creator of EduTecher, this services aims to provides resources, links, articles, and information relating to education. You can register for the site using an email address or linking your Facebook or Twitter account. You must be invited first, so make sure that you request an invite from the site. Once stuff is clipped, you can organize the resources by popular, most recent, and by categories. You can also sort by the type of clip (video, audio, document, download, etc). At the same time, EduClipper is also a social network, meaning that you can share and communicate with other members of the site. You can also follow and see what they are clipping. There is an available bookmark tool that will let you easily clip resources to your clipboard. For more information about how it works, see the video below. Quicklinkr, which is currently in beta, is a option for bookmarking your favorite links. Users can copy and paste any URL and then the app will provide a visual snapshot of the link onto your "quickboard." Quicklinkr is free to register and you need to provide the usual information to use the service. Each quickboard will have its own URL that can be shared. Students and teachers could use this service to provide information about resources pertaining to a project or a unit of study. You can alter the look of your quickboard as well. By registering you are provided the option to create folders as well. Listango is another option in a bookmarking tool that allows users to organize their favorite links in one location while also creating a system for keeping those links in various folders for easy viewing. A Bookmarklet makes it easy to use the service while also allowing the links to be public or private. You can sign up for the service using a Facebook account or by using the usual email and password for login purposes. For $.99 you can also download the iPad App. For more information, see the video below. Web 2.0 - The term given to the current age of the World Wide Web where the web is used for interacting with a web app, and collaboration and sharing with others. Most common examples include Wallwisher, Glogster, Prezi, etc. PLN - Stands for Professional Learning Network and is the communication and relationship between educators with whom information and resources are often shared. It is an engagement between people that often starts online, but then moves to the real world through conferences and other connections. Twitter and Blogging are the most common place that PLN's grow. For more information about PLN's, visit Project PLN. Social Media - In a nutshell, it is media that is for the purpose of sharing and interacting socially. It allows media content to be opened for discussion. Social media can include text, audio, video, images, podcasts (see below), and other multimedia communications. YouTube and Skype are good examples. Social Network - A web-based service that allows individuals to create an online public or private profile with which to share connections with others and engage in discussions and sharing. Facebook, Twitter, and Edmodo are examples. Digital Native - This is the term given to the generation of students that have grown up in the digital world and are using technology to communicate, educate, share, record, and learn about society. This term often implies that students have an adapted sense of how to use technology easier then previous generations. For more information and reading, I recommend From Digital Natives to Digital Wisdom and also Born Digital. BYOT/BYOD - Bring Your Own Technology/Devices is a movement where school districts, schools, and teachers are encouraged to allow students to bring and utilize the technology they already have. Whether it be a Phone, iPod, iPad, Kindle, laptop, or other device, they have it, so let them use it. For more information, read Districts Struggle with BYOT Policies or see the video below by NBC. Cloud Computing - We often hear "In The Cloud" and what they are talking about is services and applications that host data, files, and information at remote servers around the country/globe and then this data can be accessed from any device. Imagine taking your computer's hard drive and making it a website; you can then visit that website when you need access to your computer. The most common understanding of this is cloud storage, which is applications like Google Drive and DropBox where files are stored "in the cloud," therefore available from any device through logging in to the service. TeachMeet - An unconference, meaning participants are usually in control of their own conference. TeachMeet is an informal gathering of educators where the sharing of ideas and lessons used in their classrooms is by educators is encouraged. Often times they contain short information sessions that provide enough time to be introduced and then be given contact information for more opportunities to network. To find one in your area, type in "TeachMeet" followed by your state/province/country in a Google search to find one. You might also look at bordering regions as well. Hashtag - If you are an avid Twitter user then this term is nothing new to you, but if you are not, then the best way to describe it is a categorization of tweets that are sent on Twitter. Hashtags are important because it provides a way to find information you need on twitter. The "#" is used in front of the text you are wanting to search. Some popular examples are #edchat, #edtech, #elemchat, and then chats for each major subject area #sschat, #mathchat, #scichat, and #engchat. If there is a term that you want to find tweets or information about, just place a "#' in front of that term. You do not have to have a Twitter account to do so, just search for it on the Twitter Homepage. Digital Storytelling - Ever been to a wedding, birthday party, or anniversary party and seen a continuous loop of pictures? That is an example of a Digital Story. In the classroom, students and teachers can add video, audio, and present using digital story telling. See my posts related to Digital Story Telling to find options for creating your own. Backchannel Chat - During lecture, discussions, readings, and video, teachers could be having a real time chat while those activities are happening. Backchannel Chat allows an avenue of communication for students to discuss what they are learning, while they are learning. TodaysMeet and TitanPad are popular options. You can find other backchannel chat options in previous posts I have written. Screencasting - You are struggling to know how to do something on your computer. You visit YouTube and type it in and there a multiple videos showing you how. That is Screencasting. The idea is you record your computer screen with or without audio and create a video of what is happening on your screen. A great resource for when trying to showcase a website or concept for your students. Screenr and Jing are options for creating your own screencast. Audience Response - Often times called Clicker Systems, but with mobile technology taking off, the aspect of actually using a clicker is starting to diminish. Using a web-based software or power point slides, teachers can ask a question and students use a device to respond to that question, which provides real-time results for the teacher. Poll Everywhere and Socrative are popular options for this tool. Podcast - Think of a weekly radio or TV broadcast, and make it a file for showing/listening to it on an iPod or MP3 player. A podcast is a digital audio or video recording that is most likely part of a themed series that can be downloaded from a website to a computer or device. Most can be found on iTunes but many teachers create their own as a way of communicating with parents and students. Here are 10 Ways to use iTunes/Podcast in the classroom. Infographic - A graphic or visual representation of information and data presented in a quick and clear method. Infogram, Easl.ly, and Visual.ly are three examples of sites for creating infographics. For more information about inforgraphics, click on the sample below. Digital Citizenship - The expectations, behaviors, and rules for internet, email, social media, and social network use by not just students, but all people. It also emphasizes the importance of protecting privacy and being aware of misguided information on the web. For more information visit Digital Citizenship for more information and this useful PDF: Digital Citizenship - Addressing Appropriate Technology Behavior. Browser - The software application for searching and retrieving information while travelling around the World Wide Web. There are several browser options out there available to users. Internet Explorer is probably the most widely used in schools, although Firefox, Safari, and Google Chrome are making serious headway in amount of users. Blog - Often times referred to as an online journal, but considering how most of them are shared, it would not be a private journal. Basically a blog is a website that contains the writings, opinions, thoughts, experiences, and resources of an individual or group that is shared on a regular basis. If looking to start a blog, Blogger and Wordpress are free options and here are 10 Tips. If looking for some blogs to read I suggest here and here. Here are some tips for using Google Reader as well...which helps you organize blogs you are reading. Another great way to find education blogs to read are the EduBlog Awards. RSS (Really Simple Syndication) - This is a service provided to help visitors of blogs/websites to "subscribe" to them using a service like Google Reader and as content to those sites.blogs are updated, they are automatically fed to you. As new content is added, you don't have to check back and see what it was, as it is fed to your Reader. A great way to follow blogs and other sites. BONUS: Creative Commons - As people publish information to the web, Creative Commons lets visitors and users know about the ability to republish the information. So, if you start a blog, this is how you permit the use of the material. Especially important if you have student or classroom blogs that you utilize these licenses. For more information, visit Creative Commons. What terms would you include that I might have left out?? With an increase in the use of cloud storage, whether it be DropBox, Google Drive, Box, or SugarSync, organizing and remembering what files you saved where can be a daunting task. Otixo is an App that provides users a way to access and organize their files across multiple cloud storage apps. For personal use, Otixo is free, but has a limit of 2GB of Bandwidth; meaning the amount of network traffic or data transfer that you use while interacting with your files in Otixo. The App also allows users to preview documents and images before opening them. Users can copy and move files from one service to another without downloading to your computer. It's as easy as drag-and-drop. One extra feature is called Spaces, which allows users to create a space for sharing files and folders with others. These Spaces allow you to determine what access is provided to those that you collaborate with. You can learn more by watching the video below. If you find yourself using multiple Cloud based storage services, then Otixo is definitely worth looking into. Edcanvas is an web service that allows users to drag and drop various content to a canvas and then easily share that canvas with students and other faculty. Content can include PowerPoint presentations, YouTube videos, PDF's, images, and other content. The service is currently in Beta and free for teachers to register. If entire schools are interested there is an option for school wide implementation, and you can learn more about that HERE. Single users can currently sign up with a Google or Facebook account, or independently. Edcanvas is not only for teachers. It also provides students the ability to create a canvas as well. This would be a great way for students to organize information for a project and present a project at its conclusion. Students can also work together on a single canvas. As users add resources to the canvas, it allows the ability to comment on them as well, which could create active discussions about all the content from a unit. You can also embed a canvas onto a website or blog or even into Edmodo. Like a lot of educational technology websites out there, Edcanvas also allows you to view a previously created canvas. To ensure that Edcanvas works properly, it is best to make sure that you are using Google Chrome or Firefox. For easier usability, having a Dropbox or Google Drive account will be beneficial as well. For more information, see the video below. 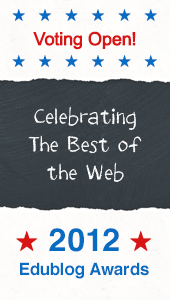 The 2012 Edublog Awards have come to a close and the winners have been announced. You can find the winners and runner-ups in each category HERE. As I always like to say, this is the best way to be introduced to the "Best of the Web" in integrating technology in the class room and meeting those people who are both pioneers and new to educational technology. One of the reasons that I have become a fan of these awards is the ability to read the teacher and student blogs that have been created. It provides great insight into how other teachers are not only using technology, but how they are being engaged with their students and trying new things in their classrooms. Sometimes the best success is a result of failure, and often times we learn how to do things right when they don't go as planned the first time. If you are just getting started in learning about educational technology, the Edublog Awards is a good starting point. The blogger for Free Technology for Teachers, Richard Byrne, has created a new blog, iPad Apps for School. Through this blog, teachers will be able to learn about free and paid apps available on the iPad. Visitors will also be able to watch videos and reviews of the projects as well. Mr. Byrne is a dedicated educator and blogger who does an excellent job of sharing technology education resources on a daily basis. Mr. Byrne is a valuable starting point for learning about what is available on the web and on mobile devices for teachers. I highly recommend bookmarking iPad Apps for School, especially if you use them in your classrooms or are contemplating the purchase of iPads for your district. Do you have an awesome iPad App that you think should be shared on his page? He has created an opportunity for visitors to do just that. Share an App is a great way to promote what works in your classroom. If you are not using iPads in your classrooms, but are using Android devices, never fear, Mr. Byrne has also created a page for Androids 4 Schools as well. The same premise applies to this blog as well and provides information for Android based devices. To see his original post about his new site, CLICK HERE. Three Ring App (Also on Android) allows users to take pictures of student work and keep track of them online. It is an easy way to organize and present students' real world work from hand written assignments to presentations. You can also include videos. Visit ThreeRing to learn more and to sign up. It is free for teachers. The Wunderlist App (also available on Android) is a necessity for teachers needing assistance with staying organized or are just looking for an app to help them focus on all the requirements of the job. Due dates for lesson plans, and assignments. Professional Development, PLC, and school meetings clog your calendar. Wunderlist provides teachers the ability to easily sync and manage all their "To Dos." Most of us that have an iPhone or Android phone have heard of or seen the Bump App that allows users to easily transfer photos and other files from one device to another. Now that same services offers users the ability to "bump" pictures to your computer. With bu.mp you can take photos on your phone to your computer by simply visiting the bu.mp website and tapping the space bar with your phone. Make sure that location is enabled in your browser for it to work. To see how it works, see the video below. Another App from the same company that would be of interest is the Flock App. If students are working on a project together that requires the use of pictures, Flock App would allow the easy sharing of those photos across their mobile devices. ShadowDrive is a web application that plans to make sharing content more social through various social networks. It is still in development and plans are in place to have desktop, tablet, and mobile services available in October of 2013. You can currently join for free by logging in through Facebook (Twitter in the future). You can still use the service, but the space allotment is currently small, just 1GB. What makes it worthwhile is that students probably won't be using a large amount of space in the first place. With integration into Facebook, ShadowDrive would make it easy for students or teachers to have important files or documents easily made available to students and have it appear on their Facebook Timeline. We are well aware that students are on Facebook. Now, if you have a teacher page or classroom page you can have files made available to students. Students that are working together on a project could also use the service to share pieces of a project, artifacts, pictures, videos, etc. Another benefit is that if your Facebook friends are using the App, then they would have access to the same files through the ShadowDrive site. There are several security features in place to not only protect privacy, but also to protect the legality issues that might surface. Like other applications on Facebook, you do have to provide permission to this App. Here is a video that introduces the product and provides more information. If you are an active user of social media (Facebook and Twitter) in your classrooms with your students, this might be an app worth investigating.